I don’t think I would have picked up Sunjeev Sahota’s debut novel ‘Ours Are The Streets’ if it wasn’t for the fact that I heard him read from it at a Picador event last year and was really entertained. It’s got a cracking cover which would have caught my eye but the line on the back of the novel ‘a story of our times’ would possibly have then put me off if I am being 100% honest, it just sounds a bit presumptuous. However I heard him read and loved the excerpt that we were treated to and so snatched a proof copy as I was making my way out (along with several other books, well why not) and finally got to reading it earlier this week and was pleased to see the whole book was as good as the snippet I heard promised it might be. 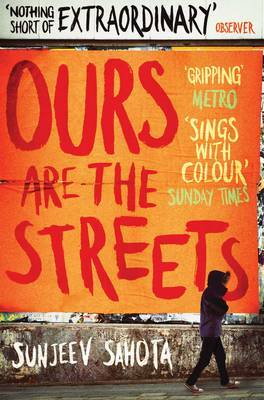 ‘Ours Are The Streets’ is probably going to get labelled as a ‘terrorism novel’ which it indeed is, yet it would be a shame if it was only seen as this as there is so much more to the novel than just that. In fact I think the terrorism is a fairly secondary aspect to the book which is really about finding out your heritage and belonging. When we meet our narrator Imtiaz Raina, as he writes from the bedroom of his parent’s house in Sheffield, we learn he is intending on becoming a suicide bomber- though whether he does or not I will leave it for future readers to find out. As Imtiaz writes in his journal each night, to his parents, to his daughter or to his wife Rebecca or ‘B’, we follow the life he has led up to this point as a married man, of a white wife he loves but who adds to his confusion and conflicts in some ways, and father ready to give his life in an act of terrorism for what he feels he believes. I say feel because there is some question as to Imtiaz’s general state of mind as the book goes on. Imtiaz also looks at the history of his family and their migration to the UK and the heritage he is from through the first and second generations and how this affects his life now and the fact that really he doesn’t seem to feel he truly belongs. It isn’t until an extended trip to Pakistan for a family funeral that a sense of true belonging and home begins to emerge from his consciousness and that’s when things start to change in both his life and therefore slowly but surely the narrative before the readers eyes. I actually found the unwinding story of Imtiaz and his discovery and feelings of his background and all this creates far more interesting than that of his radical turning of mindset. Partly, though this might be me at fault as the reader, because it doesn’t seem to have a sudden turning point or true explanation, it merely suddenly seems to happen and make sense. That is the only flaw I can find in what is an incredibly well written debut novel. Sahota holds the reader quickly and then swiftly takes us into the mind of Imtiaz and makes it all believable and real. I will say that though I was initially put off by the label of ‘a story of our times’ and indeed ‘the story behind the news story’ in many ways it actually is, yet its also much more. I really hope this book doesn’t get missed by people because it’s ‘a terrorism novel’ and therefore people might think a one trick pony, and also because it’s a debut novel. Why could its being a debut novel be off putting, well, that I will be discussing tomorrow. I pilfered this copy from the publishers when I went and saw the author, along with others, reading last year.